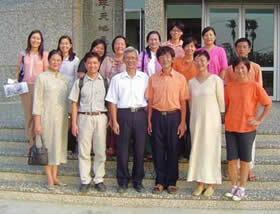 The eight members of Compulsory Education Guidance and Assistance Committee of Kaohsiung County Education Department visited the Sarkar School on October 20, 2005. The staff of the school introduced the Neohumanist philosophy and how to implement it. Consequently the school received legal recognition from the Ministry of Education of R.O.C in July 2006 and now can enroll up to 50 students. The school will conduct teachers training from January 23rd to February 23rd, 2007.